Over the weekend, I was invited by Estee Lauder's Brand Coordinator Liz to check out Estee Lauder Rustan's Shangri-La's newer counter and learn about the "Feel Beautiful In Minutes" Signature Services! 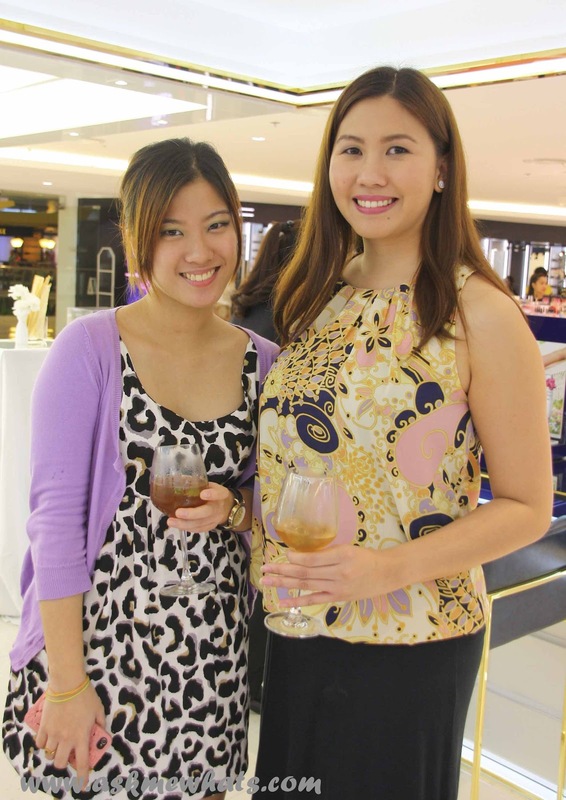 Before we talk about the Signature services, I was amazed with how Estee Lauder transformed into a "haven" for girls who like to pamper oneself! Honestly speaking, it was really embarrassing but I arrived late! It's Saturday and Manila traffic was beyond crazy! It took me 2 hours to reach to Shangri-La so while I huff and puff, I took a shot of "model for the day" Julia from Bless My Bag. She had foundation on and I whispered to Shen asking what they have done for Julia to have such lovely look even without much makeup. 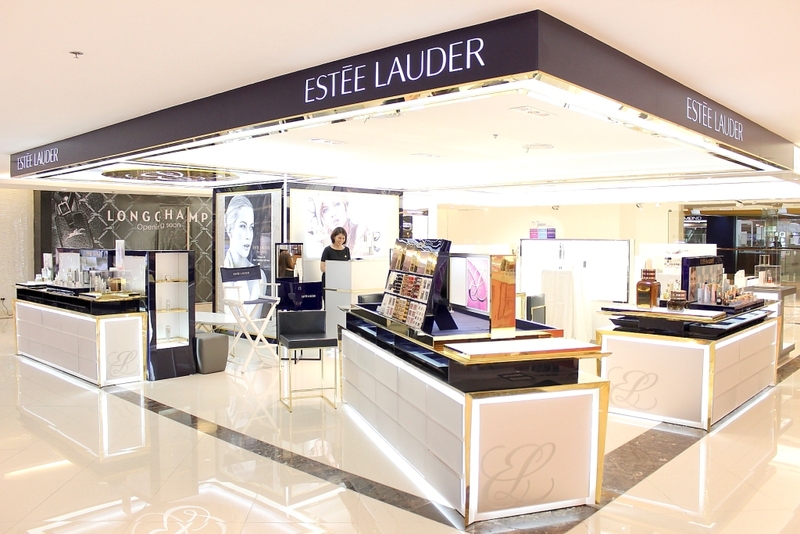 According to Shen, the Signature Service starts by preparing the skin for makeup, Estee Lauder skincare was used from moisturizer to eye cream to give an instant "lift" and "moisture" and may act as a good "starter" for foundation application. Julia's shade of Double Wear foundation was applied and here's the result. Estee Lauder's style in foundation application is imagining your nose as the center of a flower, and the rest of your face as petals: Forehead, cheeks and chin. Start applying foundation where you see the most uneveness. For most women, this is the center of the face. Blend outward. A loose setting powder was used to set foundation in place. 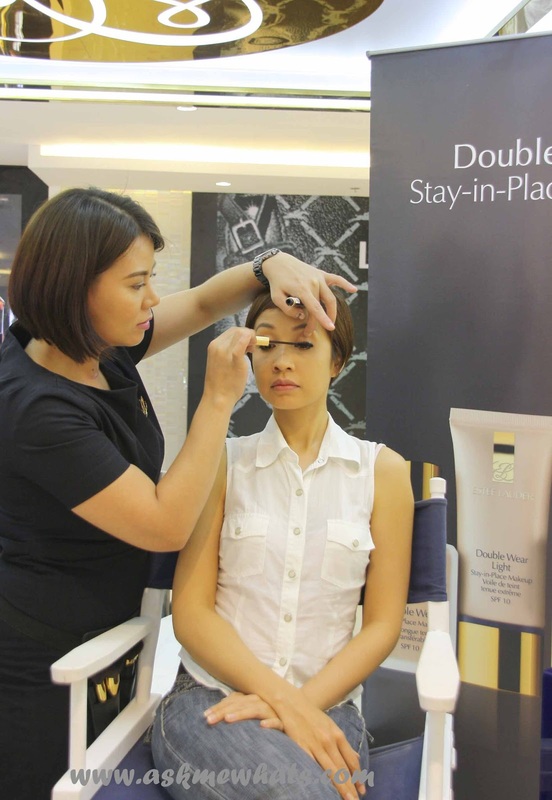 Estee Lauder's Double Wear Stay-in-Place Eye Pencil in Onyx was used to draw a line near the upper lashline. 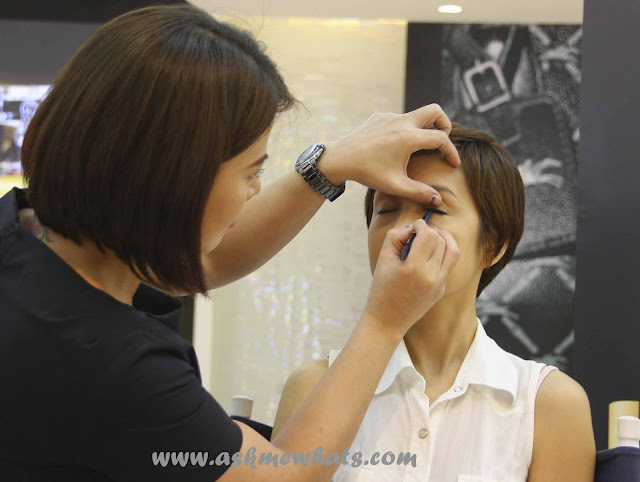 The pencil is perfect as it has smudging brush on the opposite end meant to smudge the liner and blur out harsh lines. A good amount of mascara was used to brighten the eyes. Gorgeous Julia smiling with perfectly arched brows and well defined eyes. Next, let's talk about blush application. Blush application the Estee Lauder way always starts at the apples of the cheeks blending outward to create a natural blush. The blush used on our model was a crowd favorite --- Pure Colour Blush in Sensuous Rose. To easily transform a daytime makeup to nighttime, a new trick was learned that day! With a generous amount of eyeliner (Double Wear Stay-in-Place Eye Pencil in Onyx was used in this photo), draw a circle on the back of your hand about an inch across. 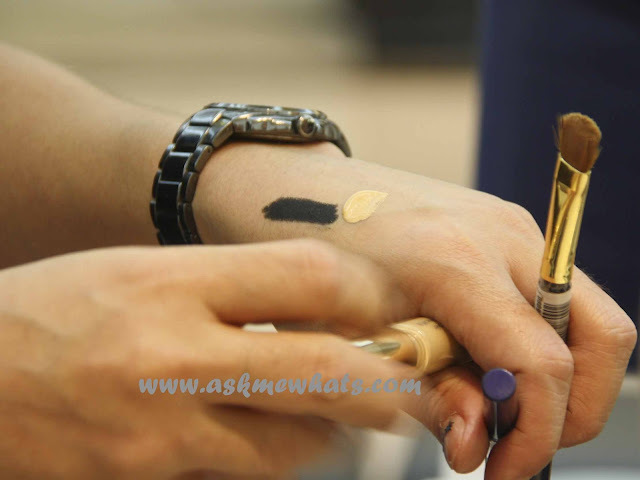 Add a small amount of Double Wear Concealer onto the hand and blend the liner until the base is creamy smooth. This is an inexpensive way to create your own cream eyeshadow base. Since the finger can warm up a product, place a little of the base onto the lid blend over the entire lid from the lashes going a tiny bit beyond. Before the cream base dries completely, pick any eyeshadow shade and use a flat shadow brush to gently press the eyeshadow into the base. This will help set the smoky look for hours and feel free to party the night away! Everyone was wearing "something bright" that day so we opted for another shoot! I learned so much that day, I hope you guys get to learn something too from my report! 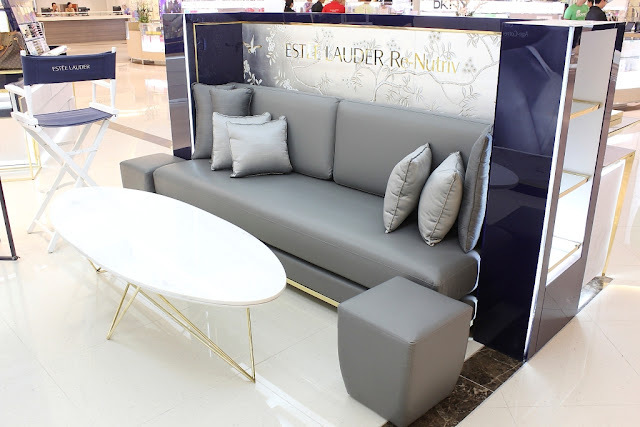 Feel free to visit the new Estee Lauder counter at the Shangri-La mall, oh, look for the gorgeous couch! I can literally sit there and relax for hours as you get to Feel Beautiful in Minutes and it's Free. Visit Estee Lauder Beauty Advisors to know the right products for you. 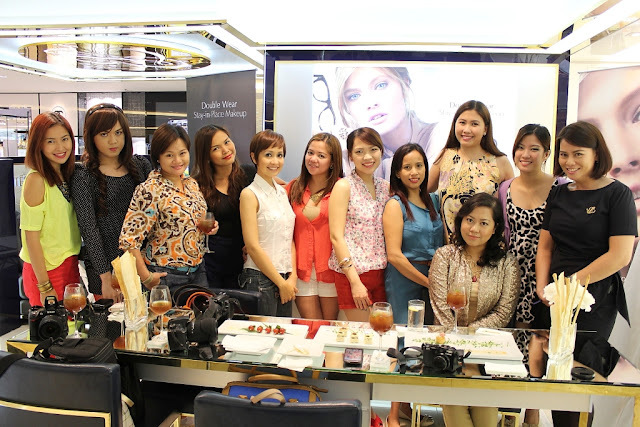 **Like Estee Lauder Philippines page. Now I know what to do with my almost dried up eyeliner gel. Pwede pala syang haluan ng concealer or foundation to make an eyesyadow. This was an educational but fun afternoon! :) It was nice to see you again dear!!! :) Mala-summer pa rin talaga tayo. Hehe!